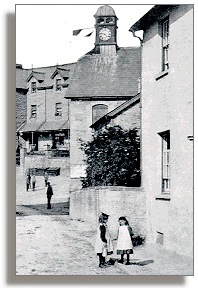 The photograph shows local children near the Tower and bridge in Talgarth. It was probably taken around 1900. This part of our website gives some idea of everyday life for children who went to local schools in the later years of the Victorian period. These pages use entries from the official Log Books or diaries of local schools. Official records did not have to be kept by most schools until 1863, and the oldest Log Book in this section was opened in 1877. The books can often tell us quite a lot about home life in those times as well as about the routine of the school itself. The children from poor families had to go to work as soon as they were old enough to bring extra income, and often missed lessons to help with farm and other jobs for their parents. Teachers come and teachers go..
Sheep, cows - and elephants !